Many visitors to Morocco will have encountered gnawa in some form or other, usually in the central square of Marrakesh, the Djma' el Fna, or at random in other towns, or perhaps in the more official setting of the Essaouira festival (established in 1998). Perhaps they have been irritated, amused or baffled by the sudden appearance of several men dancing around them, wearing dreadlocked hats, clanging large metal castanets and asking for cash. This is the most visible manifestation of a long tradition, the less obvious aspects of which can be found in esoteric musical ceremonies, carried out behind closed doors and involving therapy through possession by various spirits. This tradition traces its origins back to black slaves imported into Morocco in the sixteenth century. It's not really possible to summarize in a few words the nature of these ceremonies, which take place after dark and are known as lila (the Moroccan Arabic word for 'night'). Books on the subject tend to rely specifically on one or a handful of informants, and therefore provide local or specific accounts of the phenomenon without being able to cover its whole range of regional differences. It's therefore difficult, and perhaps unwise, to give a generalized abstract account of gnawa. Some statements should be uncontroversial, however. The ceremonies involve healing or therapy of individuals regarded as possessed by powerful invisible entities. These entities, referred to as mluk, are a part of Islamic tradition (although their status therein is ambiguous) and are assimilated with related concepts of djinns and saints. As in tarantella and other musical healing practices, the musicians are able (within the proper ritual framework) to work on the relationship between the possessed individual and the entity possessing him or her. The ceremony takes place under the joint guidance of a male master musician (m'allem) and a female 'medium' or 'seer' (entitled moqaddema). The musicians play a three-stringed bass lute (hajhouj), metal castanets (qarqaba) and sometimes a drum (tbel or ganga). They also sing. Anthropologists have cited connections between the songs, the mluk they relate to, colours, smells, ritual objects and so on, not to mention various more complex symbolic patterns (see, for example, V. Pâques, "Le Monde des Gnawa", in L'autre et ailleurs, ed. J. Poirier and F. Raveau, Paris: Berger-Levrault, 1976, pp.169-82). I don't intend to comment here on the precise nature of these ceremonies (nor am I qualified to do so). Instead I offer a brief note about the culture of which they are a part, namely, the black diaspora in Morocco. The most thorough published account of this relationship can be found in Pierre-Alain Claisse's recent work Les Gnawa marocains de tradition loyaliste (Paris: Harmattan, 2003). Claisse distinguishes between four related historical movements which together are encompassed by the term 'gnawa': the influx of slaves into Morocco in the sixteenth century; black soldiers serving the Moroccan royal family in the seventeenth century; the confraternity of ritual musicians; and a modern movement among marginalized Moroccan youth. In the sixteenth century the Moroccan empire, under the Saadian sultan Ahmed el Mansour (ruled 1578-1603), expanded southwards in an attempt to profit from the trade links (specifically salt and gold) of the Songhai empire in what is now Mali. Moroccan forces progressed through the Sahara and captured the important desert trading posts of Timbuktu and Gao, dismantling the Songhai empire in the process. They were unable to consolidate their success, however, and remained in control of this distant territory only briefly. One result of this expansion was the importation into Morocco of black slaves. A number of these entered royal service and by the end of the seventeenth century, under the rule of the Alaouite sultan Moulay Ishmail (1672-1727), their descendants had come to occupy the position of bodyguards to the emperor, a sort of 'praetorian guard' with considerable power of intervention in state affairs. According to Si Mohammed, a gnawa master from Casablanca who was an important source for Pierre-Alain Claisse's book, this group should be distinguished from those who were not attached to the royal family, but instead pursued relatively humble careers as artisans. The former were able to an extent to maintain their military role until independence (1956) and finally lost their position following the attempted coup against King Hassan II at Skhirat in 1971. Meanwhile the latter, in the context of increasing urbanization and modernization, began to lose their traditional role of artisans and, Claisse says, started to find employment as bouncers, parking attendants and other such jobs. This group, however, maintained their identity as musicians engaged in rites of healing and possession, in a context which was avowedly Islamic, but nonetheless susceptible to charges of heterodoxy. Gnawa is often identified with Sufism, although Sufis do not necessarily agree with this interpretation. One Sufi adept, who gave me a lift in his freezer van through the Western Sahara in 2005, was scornful of the idea that gnawa was a Sufi movement. Women dancing and men playing instruments was not true Sufism, in his opinion: instead Sufism involved a path, tariqa, of quiet contemplation. On the other hand, as another scholar, Abdelhafid Chlyeh, points out, the gnawi would not themselves tolerate any assertion that they do not have complete adherence to Islam (Les Gnaoua du Maroc, Morocco: La Pensée sauvage, 1999, p.15). Overall, the spiritual entities whom they invoke appear to draw on a mixture of traditions from sub-Saharan, mainstream and Moroccan Islam and pre-Islamic Berber beliefs. Not all the descendants of black slaves are part of the confraternity of gnawa musicians, and not all gnawa musicians are black, many being of mixed heritage, Arab or Berber. 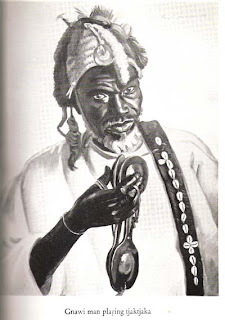 The confraternity itself can be divided along various lines, geographically or in terms of practice, but generally all its adherents recognize as their ancestor Sidi Bilal, an Ethiopian, early convert to Islam, companion and muezzin (caller to prayer) of the Prophet Mohammed. Since the 1960s, a subsidiary movement of 'gnawi' has gathered momentum, represented largely by disadvantaged youth who attach themselves to the idea of gnawa without necessarily having the expertise that the confraternity of masters have. To some extent, Claisse points out, this new wave, whom he refers to as 'gnawi sauvages', compete with the established masters in their ceremonial practice. They are viewed, however, as parasitical, and as potentially dangerous, in that through their less than complete understanding of the power of their music they can provoke trances which they are unable properly to control. The growth of this movement was to an extent promoted by the interest in 'folklore' shown by the Culture and Tourism ministries: tourists at hotels in Marrakesh and elsewhere are routinely entertained by groups of 'gnawi sauvages', who are not linked to the established confraternity of masters, whose work remains essentially underground, although they do on occasion perform in more public contexts (in which mluk are not invoked). In the 1980s Morocco, like much of the rest of the world, was turned on to the sound of reggae (typically Bob Marley). Young gnawa musicians rapidly came to identify themselves with these black singers, descended from Caribbean slaves, whom they perceived, via the media, as their trans-Atlantic homologues. "We represent the reggae movement in Morocco," they are fond of saying. Claisse notes that he attended a 'very serious' ceremony, at the end of which, to his surprise, the musicians, with the agreement of their master, performed a sort of Bob Marley tribute in Marrakeshi gnawa style (pp.60-1). In this sense the music of the black diaspora can be said to have completed a circular journey, setting out in opposite directions from sub-Saharan Africa, and meeting once again in Morocco at the end of the twentieth century. It should be pointed out that there are also recent connections between gnawa and jazz, specifically in the work of the Tangier-based gnawa master Abdullah el Gourd and his recordings and live performances with pianist Randy Weston and saxophonist Archie Shepp. This was the first ever sound system session I attended. It was in a youth club or sports hall (the Salle ALJT), down at the end of the metro line in Chatillon Montrouge, in the south suburbs of Paris. 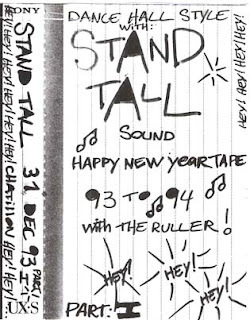 It was 31 Dec. 1993; I had missed my rendez-vous with a friend and was alone. The hall was full of smoke and gyrating bodies. I had never heard music like that before and had no idea how it all fitted together: the records, the mic men, the selector, the operator, the guy with the keyboard doing samples and fx all seemed to combine mysteriously into something extraordinary. Anyway, as luck would have it I picked up a tape of the session a couple of months later at Blue Moon, the now defunct reggae record shop just off Boulevard St Michel. So here it is: a wicked juggling selection played by one of France's premier dancehall sounds. Being New Year's Eve, it opens with the sound of bells (Big Ben, I do believe) before busting into Beres Hammond's 'Fire'. After that it's pure classics (although at the time they were mainly brand new and fresh). 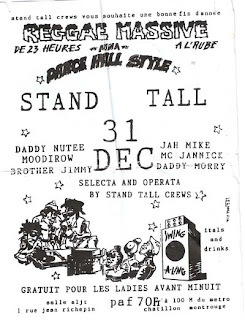 Stand Tall's selector was Polino: among the mic men were Daddy Nuttea, Daddy Mory, Moodirow and MC Janick. Nuttea went on to release an excellent mini LP, entitled simply Volume 1, and also collaborated with the Marseille hip hop crew IAM ('La 25eme image' among others). Mory was part of the celebrated Raggasonic along with Big Red and Frenchie (who now runs the excellent UK dancehall label Maximum Sound). Janick can be found on an interesting early comp of French hip hop and dancehall, 'Les Cool Sessions', produced by Jimmy Jay, MC Solaar's DJ, which came out around the same time as this session. In later works, this connection between the tarantula, its victim, and music became more and more prominent. While a number of Renaissance scholars contributed to this trend, the central role belongs to Athanasius Kircher (1602-80), ‘the last man who knew everything’ as a recent work entitled him. Kircher was a prodigious polymath who composed vast tomes on many subjects, including Egyptology and hieroglyphs, the construction of Noah’s Ark, subterranean tunnels and volcanoes, and acoustics. Kircher regarded tarantism as a sort of magnetism; at this time, magnetism was much in vogue, and Kircher argued that everything – the action of the stars and planets, plants, even love – was due to different types of magnetism. The tarantula had its own magnetism, which manifested itself in a wondrous sympathy with music; music, therefore, was the only effective cure for tarantula poisoning. Kircher’s account of this sympathy was to become classic, and was repeated by a number of writers in the seventeenth century. Soon after its composition it was translated into English by Walter Charleton and included in his Physiologia Epicuro-Gassendo-Charltoniana (1654). Kircher described how musical instruments caused movements in the air, which entered the head through the ear, and passed into the spiritus (a substance mediating between the soul and the body). The spiritus conveyed these harmonic movements to the muscles; in the muscles, the movements encountered the lurking poison and made it start to itch, which made the body twitch and jump and eventually break out into a dance. This in turn created heat, which relaxed the body and opened the pores, out of which the poison evaporated. The practicalities of the cure, however, were rather more complex than this idealized theoretical sketch. In the first place the sort of music to which the victim would respond depended on his or her complexion and temperament. Some people were sluggish and melancholic, and would respond only to loud banging or noisy instruments, and not to strings; for others, strings were quite sufficient. The cure could be disturbing for all concerned, including the neighbours: ‘a certain Girl of Tarentum, being there bitten by a Tarantula, and affected with the stupendious symptome of Tarantism, could never be excited to dance by any sounds, but those of Guns, Alarms beaten upon Drums, Charges and Triumphs sounded in Trumpets, and other military musick.’ For others, however, the ‘Harmony of Lutes, Vials, Virginals, Guitarrs, Tiorbas, and other stringed Instruments’ was sufficient (Charleton, Physiologia, p.369). 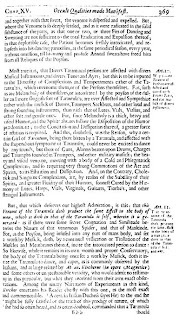 In the second place – and this, for Kircher and indeed for most seventeenth-century writers who discussed the matter, was cause for great astonishment – just as the music evoked a sympathetic reaction in the human victim, so it did in the tarantula; and just as the human victim danced in response to a certain type of music, so too did the tarantula. Kircher relates an account of an experiment, in which a tarantula was placed on a stalk floating in water, and a lute player summoned. The playing of the lute initially had no effect, until it hit upon the particular sound which was appropriate to that particular tarantula, at which point the creature began to wave its legs and shudder its body in time to the music, only stopping when the music stopped. Thus it is also recounted that in Taranto, when musicians are called to attend a tarantula bite scene, they first ask the victim where the event occurred, and what colour tarantula it was. They then go to the indicated place, catch a tarantula of the sort described by the patient, and ‘instantly fall to their instruments, and play over whole sets of Lessons one after another’ until it starts dancing. At this point they can return home, safe in the knowledge of how to treat the patient, a task in which they ‘seldom or never fail’ (Charleton, p.370). Jah Shaka Sound System, from a 1989 session in Ashwin St, Dalston, London. Shaka runs a Gregory Isaacs tune on the Promised Land riddim ('I do love you'), then plays the version, giving the following account of his recent trip to Ghana and a history lesson about the repatriation movement, before dropping a thunderous bassline. what is the connection with you and the Ethiopian Haile Selassie? and we hope to return to Africa some day. going to the promised land. will the people of London adopt this clinic? will the people of London adopt this clinic as their own? you can check I and I, give me your phone number and address. We have a direct link with Ghana! are the man and woman of tomorrow." From the archives ... a snapshot of hip hop in Mauritania, written in 2005. Nouakchott, Mauritania, January 2005. Another dusty evening. On our way to a gig we get pulled over. Not that surprising – there were police at this junction permanently, stopping cars for whatever reason they thought fit. It wasn’t the car’s European passengers they were interested in. It was the driver, a young black man. The black community in Mauritania are to a large extent segregated from the Moorish ruling caste; they have few privileges in this nation where slavery was abolished, on paper, in 1981. Our driver, the police said, was contravening the law by acting as a taxi when not licensed to do so; in other words, by giving us a lift. They took away his driving permit and told him to pick it up the next day, with a fine. He returned to the car disgruntled but seemingly unsurprised. The gig was the weekly hip hop jam, held every Friday evening in the Nouakchott ‘Maison des Jeunes’ or youth club. The door was run by soldiers; they took our ticket money, gave us our tickets and went back to controlling the crowd milling around outside. Inside it was incredibly hot. The building was evidently an old theatre and it still had its raked rows of seats leading down to the stage. The seats were all occupied and the crowd spilled out into the aisles and around the back of the hall. They were mostly young, male and female in equal proportions, and black, although standing next to me was one elderly Moor with a walking stick. At the foot of the stage was a sound system and video clips were projected onto the walls: the American hip hop pantheon, Busta Rhymes, 50 Cent, Tupac. The weekly jam provides an opportunity for a variety of musical goings-on. We saw a performance by a band called Walfadriji, who mix Mbalax and traditional Moorish music with their own brand of ‘Afro-Peul’ (the Peul, also known as Fulani, being one of the prominent West African ethnic groups). This was followed by a film interviewing Nouakchott rap crew Diam Min Tekki (who feature on the compilation reviewed below) and a series of performances by young local rappers, each of whom did one piece over a backing track of his choice, to generally thunderous applause. The event ended suddenly on the stroke of midnight, half-way through the last song; perhaps, I thought as I found myself suddenly swamped by a tidal wave of flying limbs, this was something to do with the soldiers. 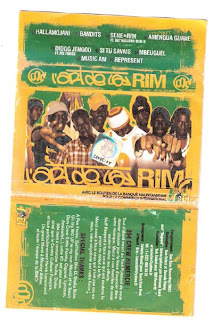 On the strength of this evening I tracked down a copy of the only (to my knowledge) compilation of Mauritanian hip hop, a cassette put together by Nouakchott’s 994 Crew and entitled ‘L’art de la RIM’ – ‘RIM’ signifying both ‘rhyme’ and ‘Republique Islamique de Mauritanie’. It’s a collaborative work which, the sleeve notes say, aims to show the country’s African neighbours that the Mauritanian hip hop scene is active. Production and arrangement was the responsibility of Tom Select and Selecta Mani2; various rappers contribute vocal performances, which are partly in French and partly in Hassaniya, the local Arabic dialect, with occasional snatches of English. The beats and overall production are stylish: although the percussion sounds and synths are simple and sometimes seem maybe a little dated, they’re nonetheless imaginatively put together, with some well-chosen samples and heavy basslines. There’s a definite reggae flavour in the background of many of the pieces, notably the squelching ‘Diogg Jengou’, in which Senegal’s acclaimed Pee Froiss put in a guest appearance, and ‘Musicam’, which borrows the melody of Sister Nancy’s 1982 dancehall smash ‘Bam Bam’. The debt in this direction is rather more evident than that to traditional local music, although a kora-sounding sample makes an appearance on one occasion. ‘Amergua Guana’, meanwhile, is driven by a sparse but effective combination of accordion and melodica. There’s a softer, more R’n’B feel to pieces like ‘Mbeuguel’ and ‘Si Tu Savais’ but generally the sound is bouncy and gritty. Interspersed with the tunes are a variety of film samples and radio clips and overall the cassette adds up to an interesting and varied mix. Not being a Hassaniya speaker, a fair amount of the lyrical content escapes me, but I can say that the rappers’ flow is universally tight without being rigid. For Amadou, the young enthusiast who introduced me to Mauritanian hip hop, its appeal is clear: rappers always tell the truth, he says – in contrast to other more established forms of communication. Six months after I left Mauritania a military coup – the fourth such attempted in only a couple of years – toppled the long-standing ruler Maaoya Ould Taya. The junta replacing him stated that their intention was ‘to create the appropriate circumstances for an open and transparent democracy’ and promised to hold elections in two years. I don’t know what effect, if any, this might have on Mauritania’s black community but I do know I’ll be trying to get hold of more Mauritanian hip hop to find out. Here's a clip of Sene*Rim. Diogg Jengou is featured on the African Hip Hop and Dancehall Minimix. This mix blends pieces from the great bands of the 1970s Moroccan new wave - Nass el Ghiwane, Jil Jilala and Lemchaheb - with folk music, spiritual music (from the Joujouka and Aissaoua confraternities) and a couple of examples of collaborations between Moroccan and non-Moroccan musicians. It's called Rih, signifying 'wind' and also 'tune', and features percussion instruments (t'bel, bendir, qarqaba), stringed instruments (banjo, hajhouj), flutes and voices. It was mixed with Ableton Live: some of the pieces run more or less complete, others are broken up into loops or fragments. Jiblia songs are generally short (5 or 10 minutes), but under conditions of excitement songs may be strung together. A Jiblia song cycle may commence with an introductory instrumental in free rhythm by each member of the band. They then go into the first song, usually in a slow, dragging rhythm; the pace picks up; a bridge increases the tempo and leads into the next song, more spirited still; one, two or more songs may follow after succeeding bridges, after which the piece closes with a long instrumental. During this l-'ail ("the boy") gets up to dance, dressed as a woman. He is a standard feature of most Jiblia bands; an added touch is dancing with a tea tray with pot and glasses on his head. Every devotee has a certain tune which can drive him into a trance almost automatically, and another which can bring him back to consciousness as soon as he has satisfied himself dancing. And each brotherhood has certain acts the members perform when they are in a trance. The Aissaoua may drink boiling water, eat cactus or pass torches over their bodies. This rih comes from around the Meknes area. Pure and unadorned it is played in the second or third part of a hadra [meeting] when the musicians are trying to calm down the adepts and work some of them out of their trances. The lute virtuoso Abdelhamid Boujendar (b. 1941) studied in Rabat and Versailles and at the time of this recording (1978) was Professor at the National Conservatory in Rabat. The lyrics are by the poet and songwriter Driss Alaoui (b. 1946). The LP from which the song is taken brings together the Franco-Arab work of Boujendar and Alaoui with interpretations of Moroccan popular songs by the group Nahawand (also from Rabat). 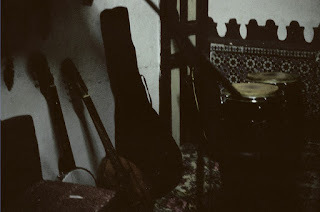 Nass el Ghiwane, Jil Jilala and Lemchaheb were themselves influenced by the Moroccan spiritual confraternities such as the gnawa and the Aissaoua, but mixed these traditional musical forms with more contemporary lyrics and instrumentation. There are also a couple of examples of collaborations between Moroccan and non-Moroccan musicians. The “gnawa-style” work of percussionist Reebop Kwaku Baah (in collaboration with Abdellcada Zef Zef and Mohamed ben Hamou Saidi) is an unusual 1976 release from Island records. An excellent account of it can be found here. There is also a short loop drawn from the American composer Elliott Sharp’s 1994 collaboration with the Bachir Attar, from the Master Musicians of Joujouka, who themselves had been introduced to non-Moroccan audiences by Brian Jones in 1971. Musik Line is dedicated to notes about sound system culture and music around the world. It is likely to concentrate on African, Caribbean and UK dub music although it will probably make some forays in other directions as and when it feels inclined.